So how does it work? And why isn’t everybody doing it? The way we breathe has a big impact on our emotions, thoughts and physical health. This is because breathing patterns can directly influence the functioning of the autonomic nervous system. Your autonomic nervous system has two branches: Sympathetic (Fight or Flight) and Parasympathetic (Rest and Digest). Both are good, healthy and natural responses to the environment. But when we get stuck in the Sympathetic response, we start to struggle with unpleasant symptoms. Getting stuck in the Sympathetic response is like setting off an alarm bell and not knowing where to find the switch to turn it off. Your body triggers a series of responses that elevate stress hormones and impair all body systems that are not related to immediate survival. That includes eating, developing loving relationships, having fun and resting. What’s more a constant state of Sympathetic arousal can provoke an inflammatory response in the body, making us more susceptible to disease and less resilient, mentally and physically, to environmental stressors. When there aren’t enough gaps between stressful events, high Sympathetic nervous system activity becomes the new normal. Even when you’re relaxing, the alarm bells are still ringing. That’s when we try to make ourselves feel better by grabbing a glass of wine, going for a run, sitting in front of the TV or whatever your favourite way of numbing out from this constant state of stress is. So, how can we rewire the brain to stop reacting to everything as if it was a mortal threat? Where do we find the off-switch for the alarm bell? Try yogic breathing. He also makes it very clear why we should do this – Pranayama balances the body and mind in preparation for meditation. If you find meditation challenging because your mind’s busy or your body is restless, you’ve probably skipped pranayama and are experiencing the symptoms of an overactive Sympathetic nervous system. 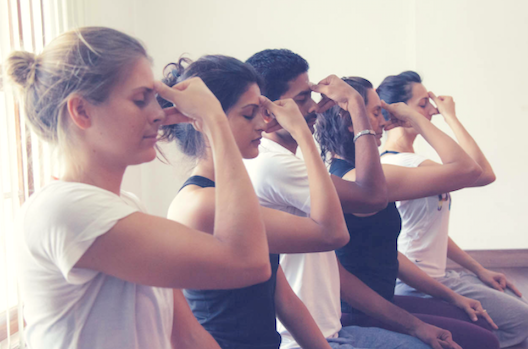 Patanjali’s description of pranayama mirrors the findings of more recent research into the impact of breathing on the autonomic nervous system. Slow, regular, deep breathing decreases heart rate and blood pressure and increase parasympathetic activity (that’s the Rest and Digest response) (Jerath et al. 2006). What’s more, this regulation of the nervous system – and reducing the nasty symptoms of stress, happens quickly when we use the right breathing techniques. You can spend hours doing yoga asana (postures), but just 5 minutes of pranayama can have a significant effect on the markers of stress (Pramanik et al. 2009). As with all yoga techniques, it’s best to learn from an experienced teacher (who learned from an experienced teacher). However, if you don’t have access to a teacher, there are some useful online resources. Here’s a link to a video that walks you step by step through Nadi Shodana, a popular pranayama practice that is designed to balance your energies and bring a sense of calm. As for when you should practice, Patanjali says that pranayama should be done after asana (yoga poses) and before meditation. So, to get the most from your practice, trying doing some gentle yoga postures that synchronise the breath and movement, then rest in Savasana for a few minutes. Then find a comfortable sitting position (cross legged, kneeling or in a chair) and practice pranayama. You may find that you spontaneously move into meditation when you finish. If not, just notice how you feel and move on with your day.